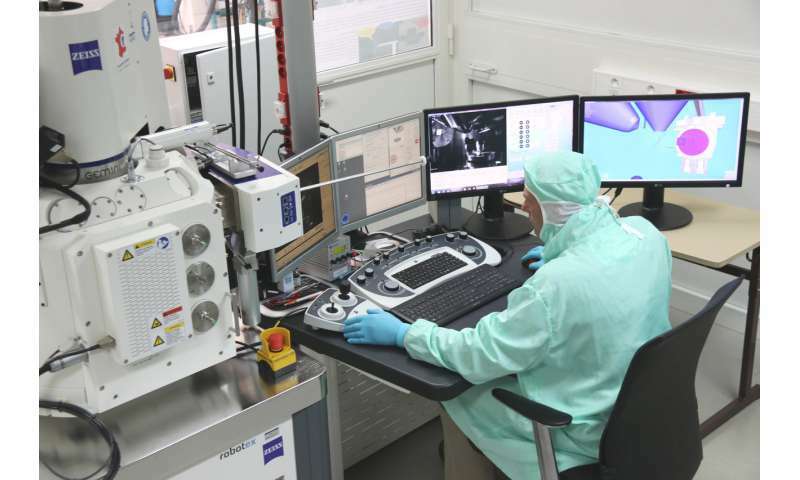 A French nanorobotics team from the Femto-ST Institute in Besançon, France, assembled a new microrobotics system that pushes forward the frontiers of optical nanotechnologies. Combining several existing technologies, the μRobotex nanofactory builds microstructures in a large vacuum chamber and fixes components onto optical fiber tips with nanometer accuracy. 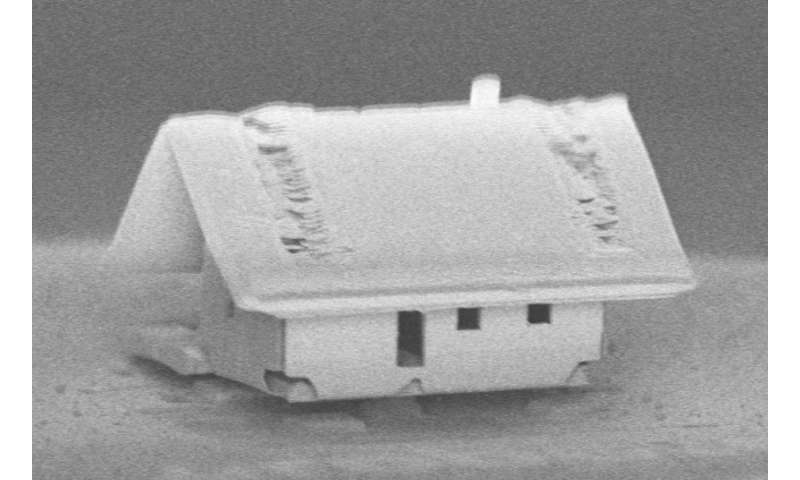 The microhouse construction, reported in the Journal of Vacuum Science and Technology A, demonstrates how researchers can advance optical sensing technologies when they manipulate ion guns, electron beams and finely controlled robotic piloting. The French engineers combined all the technological components for nanoassembly—a focused ion beam, a gas injection system and a tiny maneuverable robot—in a vacuum chamber, and installed a microscope to view the assembly process. "We decided to build the microhouse on the fiber to show that we are able to realize these microsystem assemblies on top of an optical fiber with high accuracy," Rauch said. Building a microhouse is like making a giant dice from a piece of paper, but nanoassembly requires more sophisticated tools. The focused ion beam is used like scissors to cut or score the silica membrane "paper" of the house. Once the walls fold into position, a lower power setting is selected on the ion gun, and the gas injection system sticks the edges of the structure into place. The low-power ion beam and gas injection then gently sputters a tiled pattern on the roof, a detail that emphasizes the accuracy and flexibility of the system. In this process, the ion gun had to focus on an area only 300 micrometers by 300 micrometers to fire ions onto the fiber tip and silica membrane. "It's very challenging to pilot the robot with high accuracy at this cross point between the two beams," Rauch said. He explained that two engineers worked at multiple computers to control the process. Many steps are already automated, but in the future the team hopes to automate all the robotic stages of assembly. Now, using the μRobotex system, these engineers are constructing functionalized microstructures to detect specific molecules by attaching their microstructures onto optical fibers. The nanorobotics team is hoping to push the limits of the technology further still, by constructing smaller structures and fixing these onto carbon nanotubes, only 20 nanometers to 100 nanometers in diameter. I agree Ironhorse, but seeing the shapes of those points, I believe them to be the actual welds, which on that scale would be a PITA for sure. Even the ion beam stitching on the roof is partially welding it through to the backside of the roof-plates to the top of the end walls. The rest of the roof does not appear to be 'textured' the same as where it was stitched to the walls. That said, having been a welder, at that scale welding Anything is going to be a pain, and the process is starting out with way more power than they need, so the welds will look a little sloppy to us, at this scale. I am sure they will improve with practice! "Building a microhouse is like making a giant dice from a piece of paper"
-I'm sorry but appreciating this simile is as hard as making a bicycle with a noodlegun.